We've always painted at our easels on the last day of school. I've assumed it was because we always start our school year with easel painting and the two sessions served as symbolic bookends, or maybe a framing story, for the year, something for me to know. This year, however, something popped from my mouth as I talked to the parent of a child ready to move on to kindergarten, something I'd not thought about before, or perhaps that I'd simply avoided thinking about it: "Unless you do it at home, this might be the last time she sees easels painting." The words, as I heard myself say them, hit me like a physical weight. I stood there watching her paint the arcs of a rainbow. There is painting in kindergarten, of course. My daughter Josephine brought home paintings she'd made in her twice weekly session with her school's art specialist. 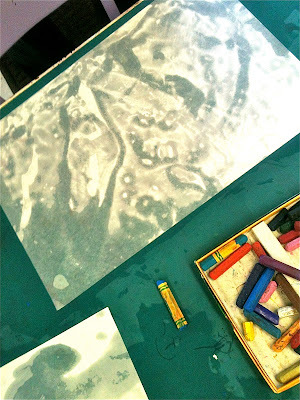 In fact, she produced more paintings during her kindergarten year, I think, than she had the previous year in preschool. That's because they made all the kids go to the art room together and painting, usually on a theme, or experimenting with a technique, was the only choice. 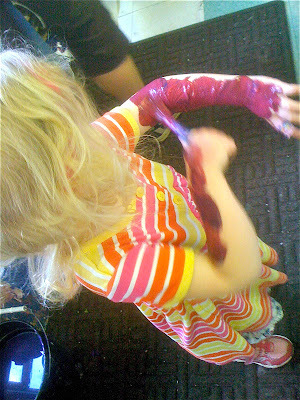 In her preschool, like in our preschool, the kids only painted if they were moved to paint, and when given a choice it was usually dramatic play for Josephine. Next fall when I run into my former students, the ones not painting at easels in kindergarten, most of them will enthuse about how much they love their new school, about their new teacher, about their new friends or playground or lunchroom. Sometimes they come back to the preschool for a visit and I'll ask them, "Does this place look as big as you remember it?" and they'll usually answer, "No, Teacher Tom, it seems really small." And they might even affect a bit of the too-cool-for-school attitude, but it will only last until they get their hands in the sensory table, their feet in the sandpit, or their fingers around a paint brush. During our last week of school we explored a technique I learned from Josephine's elementary school art teacher. 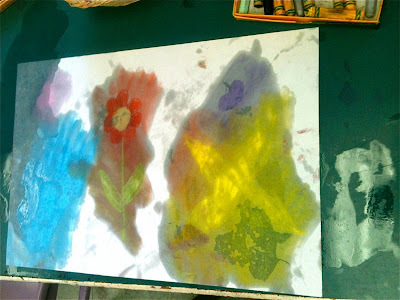 The idea was to experiment with the solubility of oil pastels by first drawing something, then dipping cotton balls in baby oil which you then use to blend and smear your colors around the paper. 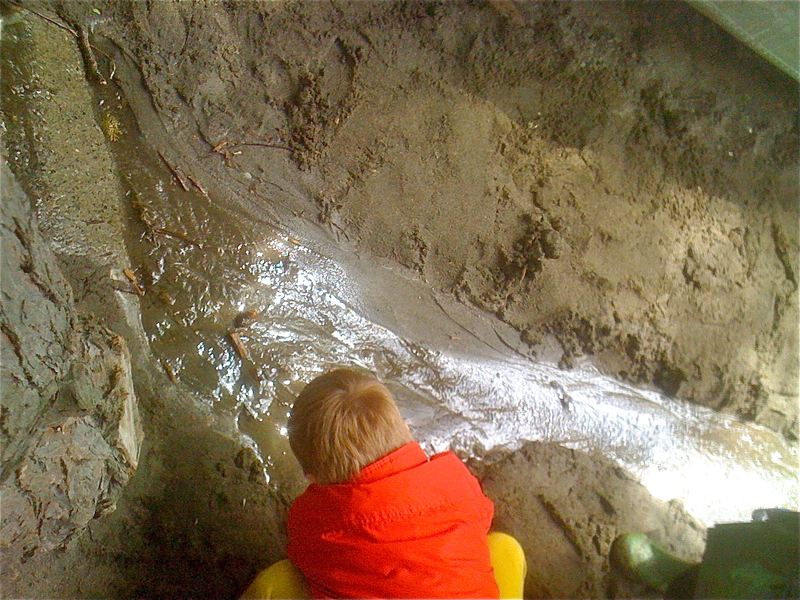 We've been doing this at Woodland Park for awhile now. Our finished paintings never look anything like the ones that hung gallery-style in the hallway of my daughter's school. I'd asked the art teacher about the technique because the results had been so striking, and yes, we always manage to produce one or two that achieve the ghostly translucence of those kindergarten paintings, but most turn out looking like oily chicken scratches. No, our baby oil-pastel paintings are definitely about the process, one that usually involves the excessive use of oil, slippery surfaces, slippery skin, and the overwhelming scent of an infant's nursery, an odor that Calliope and Henry's mom Megan told me "is not a selling point" of the activity. 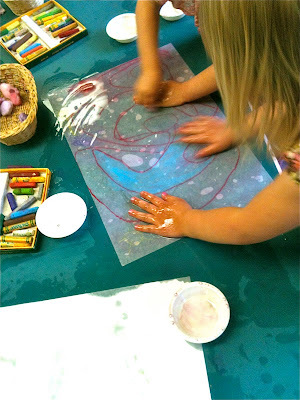 In other words, what we do, in the language of most kindergarten art teachers, is "make a mess." 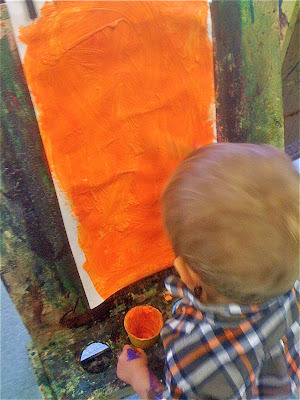 If we make "paintings" that's often just what we've agreed to call whatever's leftover when the kids are done. 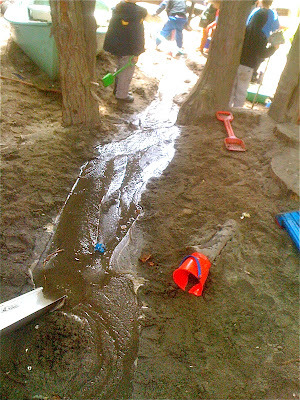 I've sometimes sent the paper towels used for "clean up" home with the kids because that's all that remained of their exploration. I really don't mean this as a criticism, but the whole idea of "making a mess" as something to avoid becomes a more prominent part in children's school lives as they move away from our preschool. For some children, this is a huge loss, while for others, the ones who have always been averse to getting messy, like my own daughter, it might seem like it's not such a big deal. I would assert, however, that it impoverishes education for everyone. I mean if nothing else, there's a lot to be learned from watching others make a mess, or from having to summon up the courage to give something that looks fun a go. Every now and then a parent will suggest that I have prejudices about kids who don't like to get messy. I don't think that's true, but even if it is, certainly I serve as a kind of counterbalance to the majority of adults in a child's life who have prejudices about kids who like getting messy. Making a mess means cleaning up. Listen, I get that. 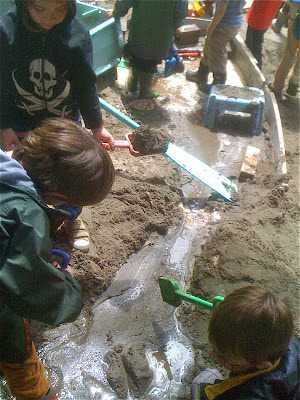 I just spent most of last Saturday with a team of parents cleaning up our outdoor classroom. A couple parents spent two hours just picking garbage (bits of paper, broken toys, snarls of twine, etc.) from the wood chips, a project that could have gone on for hours longer. 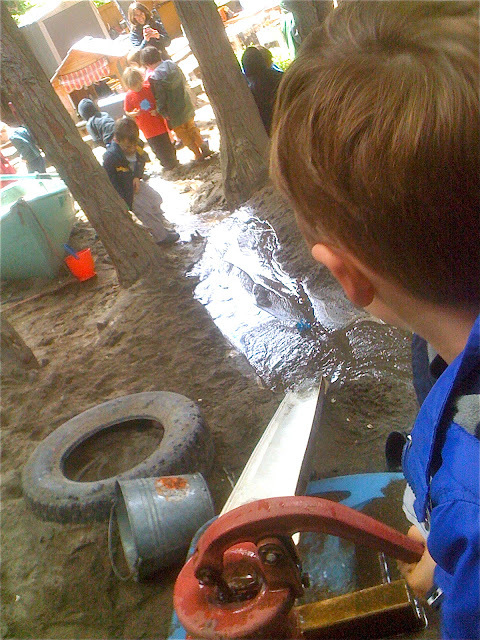 I've always said that an ideal preschool classroom would be one with a large drain in the middle of the floor and access to a high pressure hose nozzle. I understand that as a teacher in a cooperative, I'm blessed with plenty of adults who can help with the messes we make: I'm sure I would have a different attitude if I, on a day-to-day basis, was solely responsible for dealing with it. When Josephine was in kindergarten her teacher Janet started asking me to "bring in" projects for the kids. For instance, she wanted me to temporarily install the cast iron water pump on the playground. The kids, of course, got wet and muddy. As we helped towel them off, I said to Janet, "You should permanently install a pump," to which she replied, "I'd love to, but the parents would complain about the kids coming home messy." "Aren't they going to complain about today?" She laughed, "Yes, but today I can blame you," and she did. I know a lot of schools have eliminated sandpits because they don't like how much of it winds up on the floors and in the carpets. It's a legitimate concern. When we went to move our new rug earlier this year in order to wax the linoleum floors underneath, it was so heavy with sand despite being vacuumed twice a day, that it had to be disassembled, carpet tile by carpet tile, beaten clean, then reassembled. So yes, I understand the ethic of avoiding messes in elementary school, even while I can bemoan what is lost when we defer to this adult agenda. I mean, the kids don't care if there are bits of paper mixed in with the wood chips. But I worry that it's not just "dirty" messes we start to avoid. Another thing kindergarteners won't see in school are glue guns or homemade ladders or concrete slides. We also have to avoid the "mess" of everyday bumps and bruises, the kinds that make us cry and bleed and from which we learn so much about ourselves and about risk-taking. I worry that this ethic of not making messes spills over to include social, emotional, and political messes as well, the kinds that make us cry and rave and from which we likewise learn so much. It was a joy to watch the youngest kids, happily painting themselves up to the elbows, making a canvas of their own bodies, exploring, learning, making a mess, knowing that it will be two or more years before they will have to give it up. 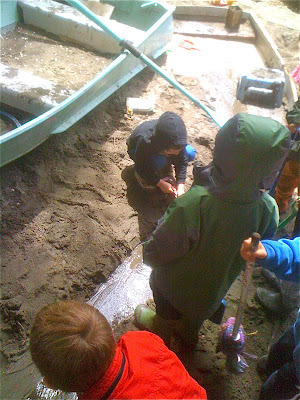 It was a crushingly sad to watch the oldest kids, industriously working together with the cast iron water pump and shovels, filling their shoes and pant cuffs and hair with sand, making a mess, not knowing that, for some of them at least, this will be the last time for school to be like this.